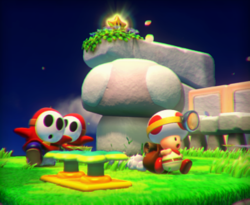 Mushroom Mesa is the fourth course of Episode 1 in Captain Toad: Treasure Tracker. This level takes place on a grassy hill with stone blocks. Captain Toad starts on a lower part of the stage where he must walk around the corner, dodge a Flaptor, and enter a movable Touchstone. The player must tap the block on the Wii U Gamepad to raise the platform to the next level. Here, he can find two Shy Guys and many Turnips, as well a cave which leads to a subterranean area with three movable blocks. With clever usage of the openings in these blocks, Captain Toad can reach the highest point in the level, where the Power Star awaits. Super Gem 1: In an alcove near the spawn. Captain Toad must enter the second cave and travel around the corner to reach it. Super Gem 2: Obtained by defeating the two Shy Guys in the course. Super Gem 3: In a cave beneath the third movable block. If the player enters the hidden opening on its side and lowers it, they can then access it. Defeated all of the enemies! This page was last edited on April 15, 2019, at 13:28.